What do pumpkins have to do with paper? The answer to this, I do not know. But, what I do know is that you only have a FEW DAYS LEFT to take advantage of the Paper Pumpkin Promotion (say that 10 times fast). This is the monthly subscription service that brings a glorious little orange little box to your door with everything you need for a 30 minute craft ‘timeout’. Cause we are learning that time outs are sometimes necessary for our own sanity. It’s a stamp case to store your paper pumpkin stamps and a tube of Tombow the Wonder Adhesive (as Anne calls it, and I agree). Adhesive is the only thing that doesn’t come in the kit. And full disclosure. I totally copied this card. 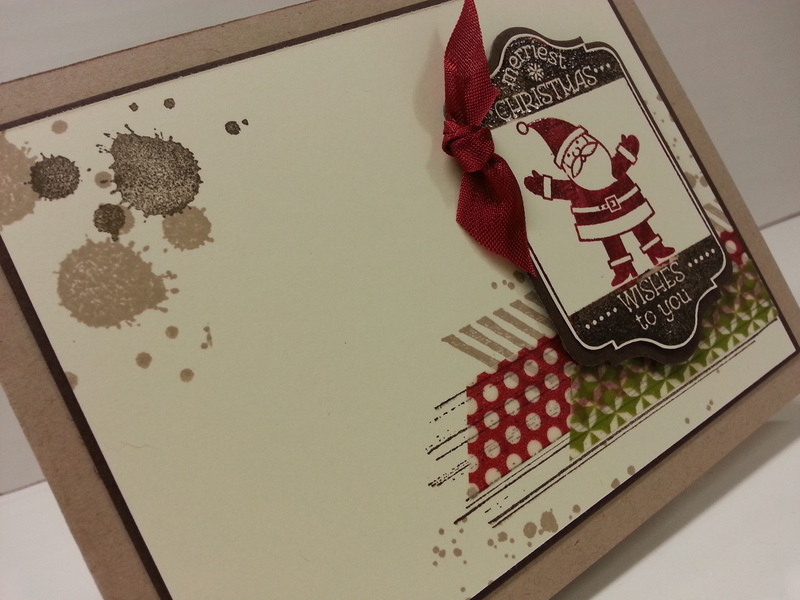 Out of the most recent Stampin’ Success. 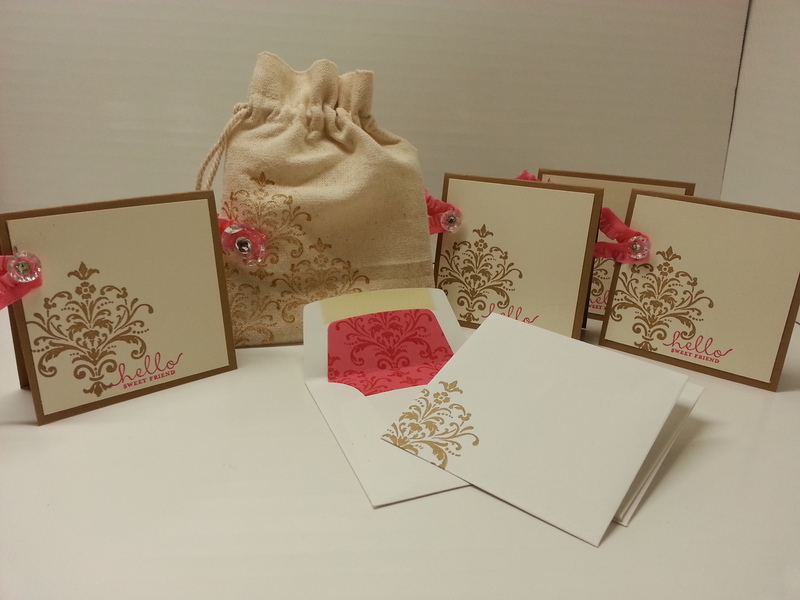 Stampin’ Success is one of the perks of being a demo. You get a beautiful magazine every couple of months that have LOADS of ideas. Ideas you can use. Right away. Like I just did. Cause I can. Your starter Pumpkin kit comes with that “hey there” stamp and the splotches stamp. The stamps that look like washi tape come from a stamp set called “Tape It”. (BTW, I LOVE that set too). I used calypso coral, summer star fruit and pistachio pudding ink, and crumb cake ink (stamp off to make it appear lighter). 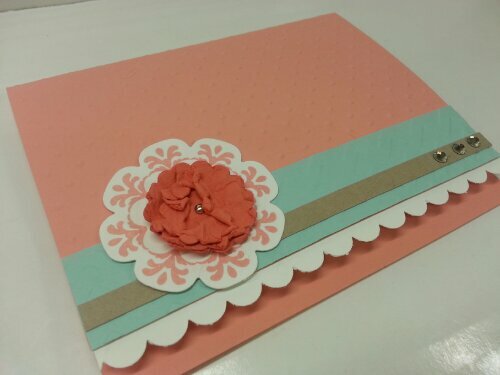 The cardstock is very vanilla and crumb cake. I’m experimenting with a black background for photos. Let me know what you think. Do you like it better than the white background?? 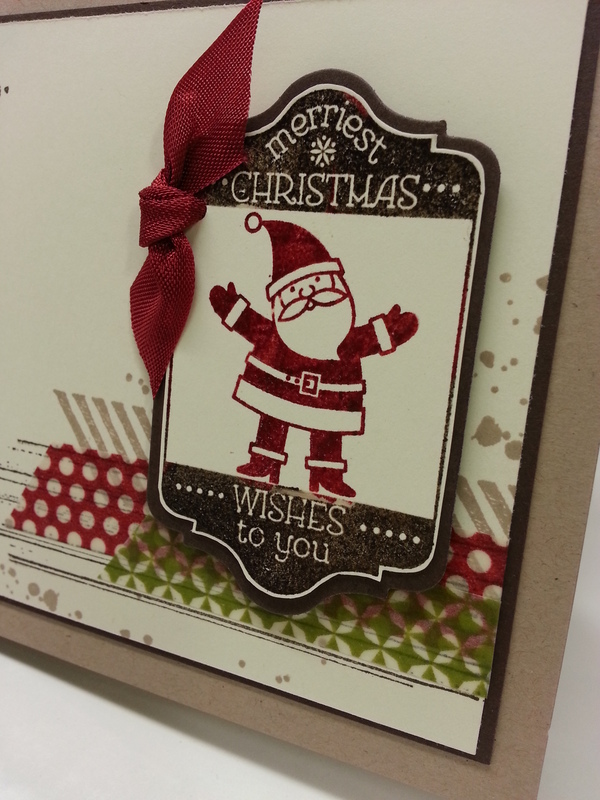 Some bling and linen thread and a couple of punches make the card just stand out. This card comes together SO fast. And it is another use for your starter kit!! 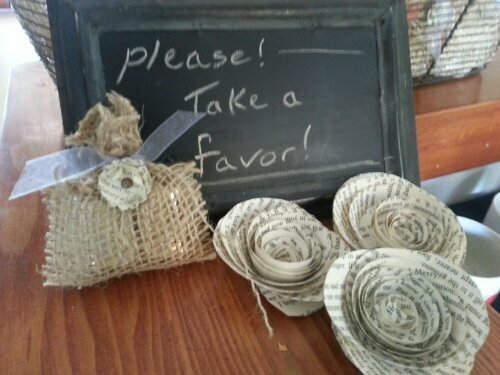 And, you can give paper pumpkin as a gift too. It’s fun to get a coupe of kits and take them and put them together with a friend. 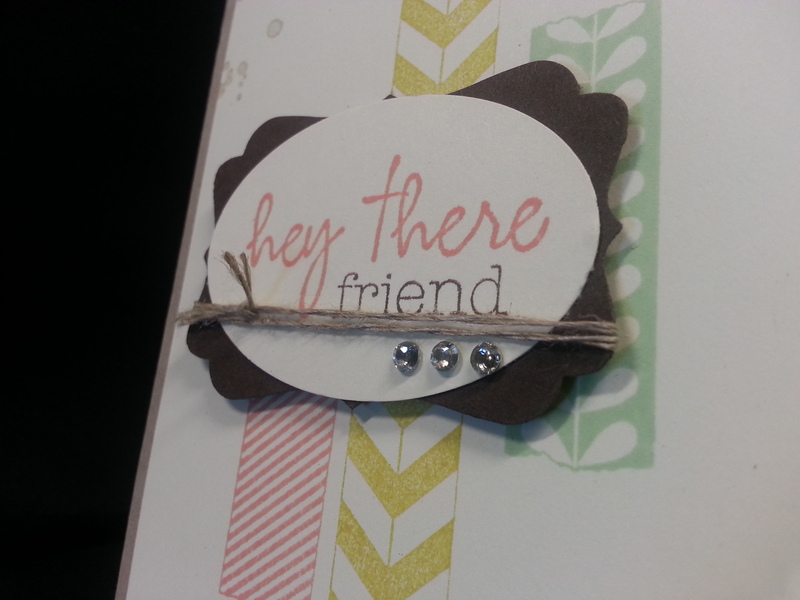 Even friends who don’t craft or are used to stamping. It’s so easy to do and put together that they will have a good time working on it with you. So, remember…. by August 31. Mypaperpumpkin.com code: PUMPKINDEAL. And I guess we can say pumpkins and paper mean an EXCELLENT time out. Do you follow my logic??? 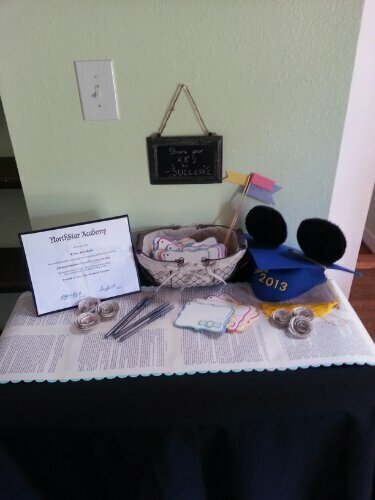 So… a few weeks ago, Aaron’s aunty and cousin asked if I would give them a little guidance on decorating for Elyse’s (said cousin) high school graduation party. I don’t think they knew what they were getting into…. asking me…. I LOVE parties and decorating and all of it. So, I think I scared them a bit, but we had lots of fun. That’s Elyse. Isn’t she beautiful? 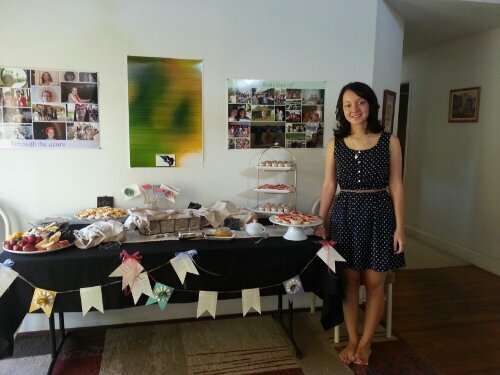 And she’s standing next to the desserts. We used the same book idea and a stash of that First Edition DSP that I nearly had to trade my first born for….to make the pennants. The colors used were strawberry slush, costal cabana, wisteria wonder, and daffodil delight. Diploma display. If you look close you can see the table runner. 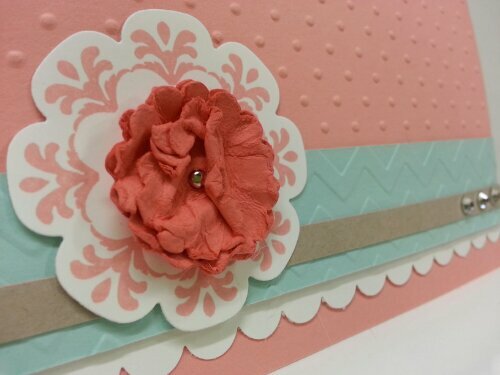 We made scallop edges out of card stock and the tasteful trim die to add color. These are those rosettes she made. I have no idea how. But that little burlapy thing is the favor. A remake of my convention burlapy thingy. Only hers has 2 nuggets. Oh yeah… it was a tea! I shoulda led with that. 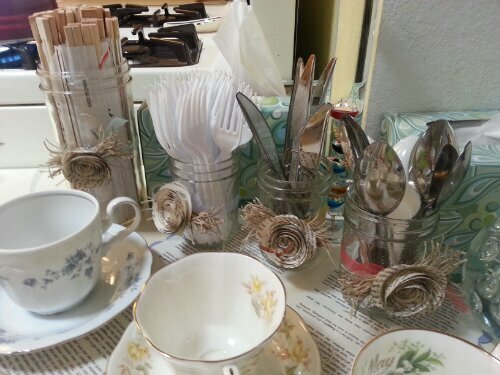 Anyway… we used decorated mason jars for stuff we needed contained. Like cutlery. 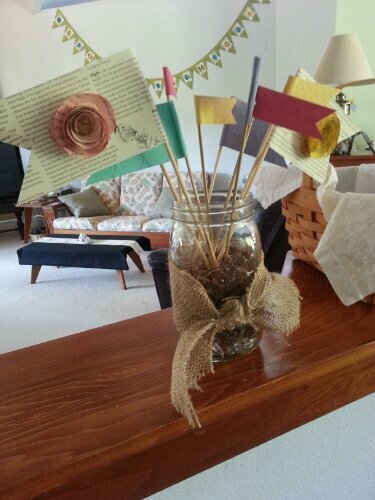 And cause we had extra pennants, burlap, and jars…. we made some jars of pennants! Cause everyone loves festive pennants. Filled the jar with heavy stuff and covered it with brown crinkle paper. And all the festivity made Isaac tired. 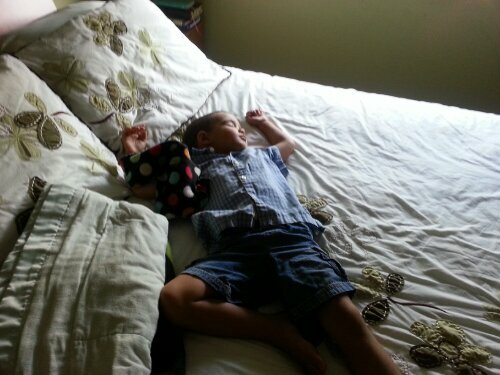 We couldn’t find him at one point and got to looking for him and found him passed out on Elyse’s bed. Wow for a little one. The second swap I was part of for convention was a wow card swap. And the rule for this is that the card was supposed to wow. So. That’s a tall order. And…. I had signed up for a children’s card swap that got cancelled…. but I had already cut the paper for the card… so, I decided to have a wow children’s card. Smaht, yeah me…. (that is Hawaii speak for “brilliant idea… you go girl”). Before we get to the wow, I want to show you some of the details on the front. I was also sad when the tiny key tag punch retired. But never fear… the little bitty labels punch worked perfectly. And I love those safety pins. They are perfect on baby cards. That is the crumb cake taffeta. The colors are so saffron, costal cabana (love it) and baked brown sugar. 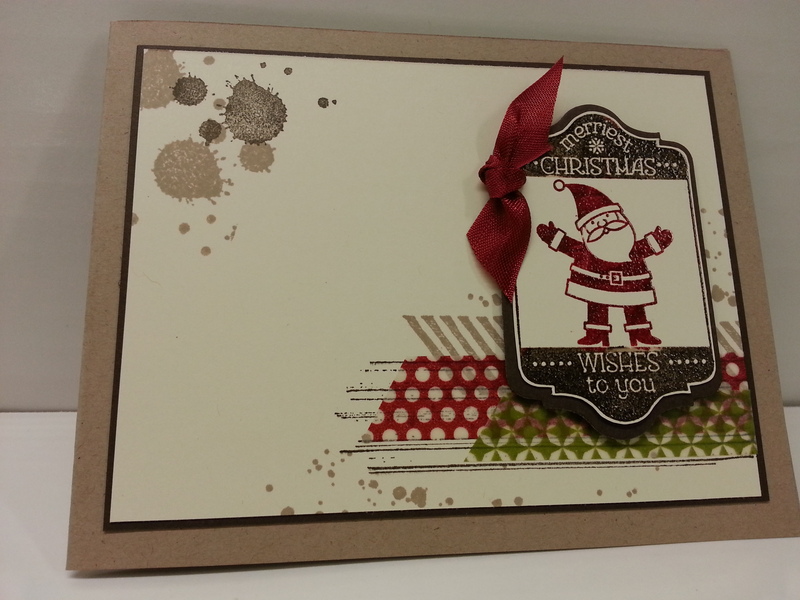 I embossed the bottom panel with the polka dots. What did we do with ourselves before embossing?? Okay. Now for the wow. And this wow is so easy that anyone can do. It’s an easel card! All you gotta do is make sure something on the inside is bumped up so it can hold the paper back. Here’s a view from the side. You cut your card base like normal (5.5x 8.5). Fold in half. Then on the front of the card score again at the half way. ( score at 2 1/8). You will then create the front of the card on another panel and then adhere it to the BOTTOM portion of that scored front. And it’s that easy. 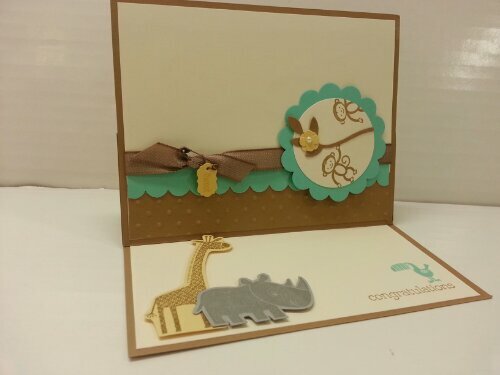 You can see how the top of the giraffe is what holds the card hope. 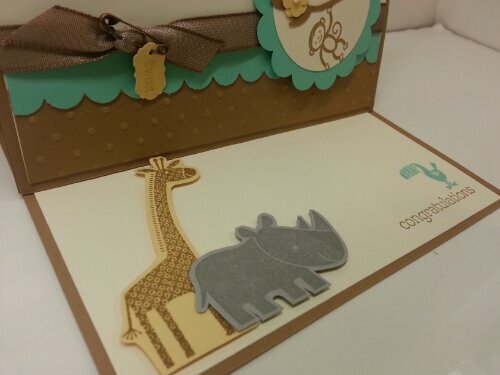 I love the giraffe and rhino. It was a little mental cutting them out but it goes fast. Do it while watching TV and it breezes by. I did it while watching Isaac dig in the sand. 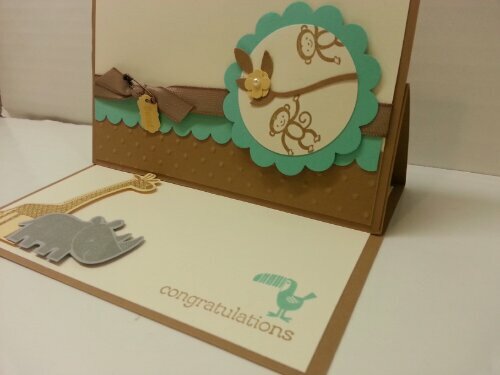 What is nice about the easel card is that it can be a nice little decoration for the recipient. And. I love the toucan. Since they are so easy… everyone can make a wow card! I just realized I haven’t shared MY convention swaps…. so here goes. So. This year my travel plans were extremely tight before convention. I returned from Kansas just 24 hours before leaving again for Salt Lake. Knowing this, I decided to just sign up for a couple of organized swaps just so I could sign up for things I was interested in. This swap was called “Top-Notch and what I liked about this one is that we had to specify the stamp set we were gonna use. That way we we got 20 cards using 20 different sets! 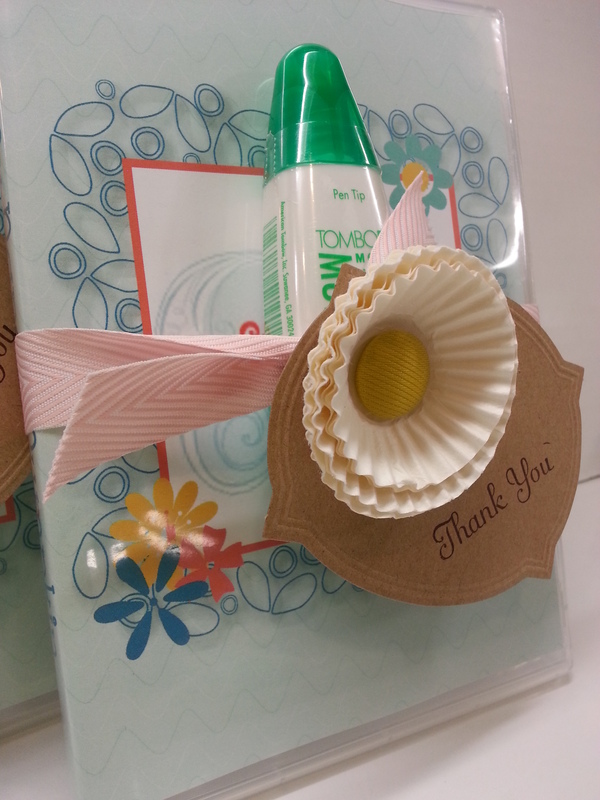 I signed up to use the Happy Flowers hostess set. Cause it is happy, happy! I am in love with the new in colors. They are so…. I don’t even know how to describe it. Anyway. 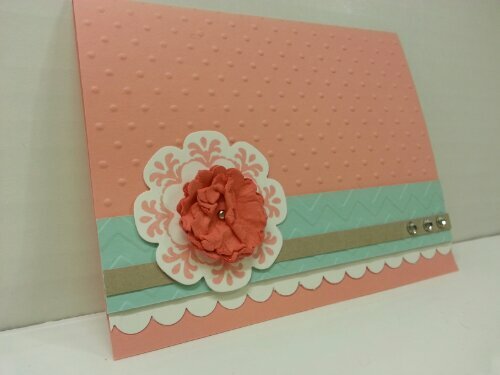 I made this with Crisp Cantaloupe embossed with the polka dot embossing folder. I added the pool party trim embossed with chevron. The strip of paper is crumb cake. And whisper white for the scallop trim. I love the crisp whiteness with the crisp cantelouoness. 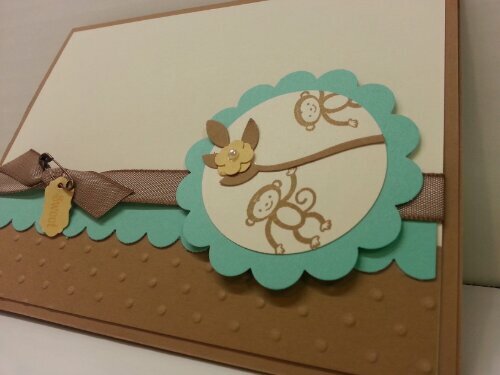 I cut out the stamped image with the floral framelits die. Then added the flower in the center. For this, I punched the 1 1/4″ scallop 3 times. Put a mini brad through all 3 and misted with water. Scrunch, smooch, sploosh, crinkle…crinkle and you have a nice flower. Then of course rhinestones. Can’t do without rhinestones. So… that’s it! My top notch convention swap. And I gotta say. I thoroughly enjoyed the seal too. Well planned and ran. And got lots of great samples. So, you probably already know that I’m in love with this year’s In-Colors. This set of cards features two: Baked Brown Sugar and Strawberry Slush. And, it has that incredible stretch ruffled ribbon. Just a small piece, but that’s all it needs. I stamped the image in baked brown sugar and used the sentiment from the stamp set “Six Sided Sampler”. And, I copied that same image on both the envelope and INSIDE the envelope with those awesome framelit envelope liner. JUST LOVE THOSE. Here is an upclose of the envelopes. And, the envie insert. 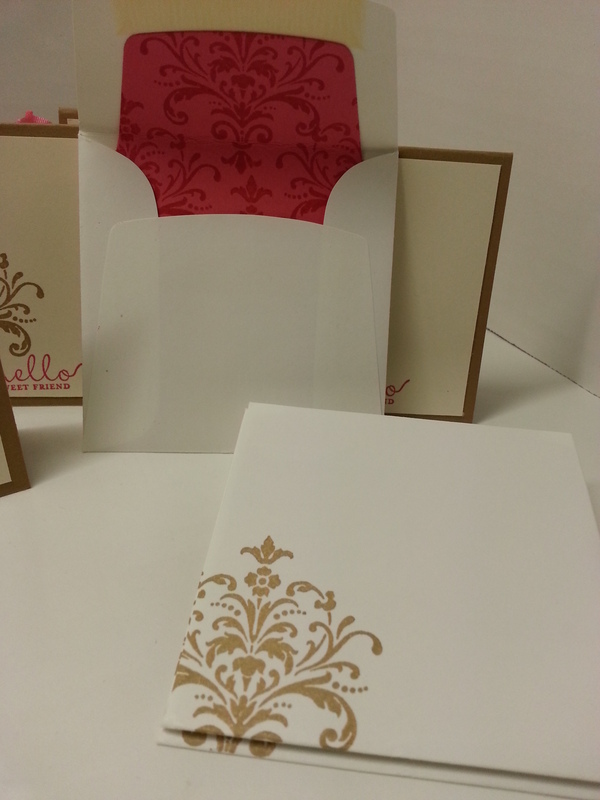 These will SPICE UP ANY envelope and make it the NOT BORING WHITE ENVELOPE. 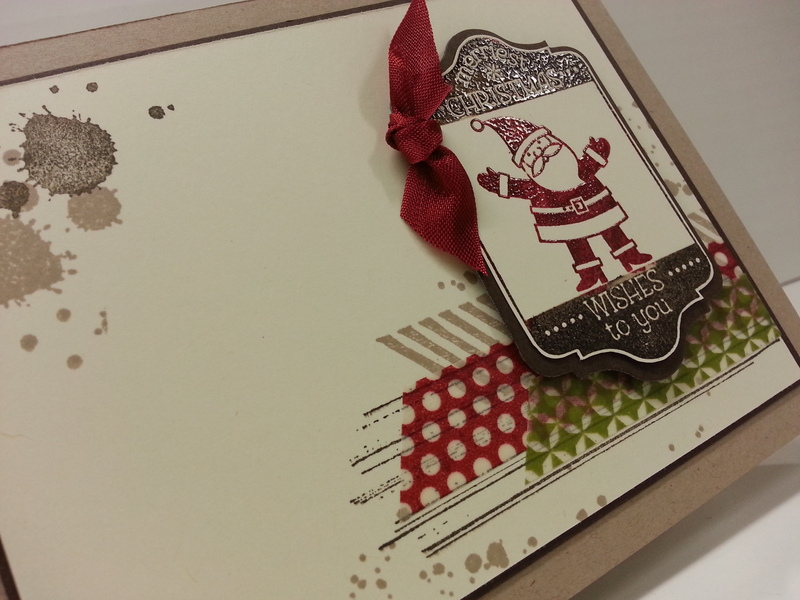 I used card stock I stamped as the liner… but, probably better would be to use DSP. Just cause card stock is a little thick. But, it still works. Final product… It’s SO fun making 3×3 cards…. Next, you are on to Deb Leigh. Enjoy the tour!! Anyway… Welcome back to the Stamp of the Month tour…. This month we are using the Ronald McDonald House Charities Set called “Tag It”. This set is special because $3 from the sale of the set is donated to RMHC. It’s so cute, and it’s for a good cause!! This set is $16.95 for clear or $22.95 for wood. The other great thing about this set is all the images coordinate with the Chalk Talk Framelits. So…. 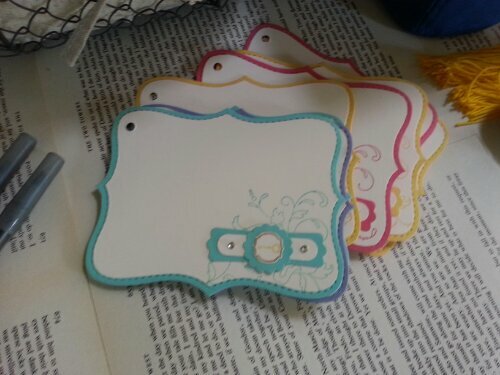 there is a matching cut-out for each one…to make it a tag!! How great is that??!!?? So, there you have it… My Christmas Card in August. I decided I wanted to maker a card, as opposed to a set of tags, so I decided I needed some other images to play with. Gorgeous Grunge to the rescue. We got this stamp set as part of or Convention goodies, and I gotta say, I had trouble WAITING till convention to get it. It makes such glorious background stuff. And, WASHI. I am truly, honestly, and FULLY in LOVE with WASHI TAPE. It’s so easy to use. And, that’s the SU washi in the Christmas Colors (p. 25 in the Holiday Catalog…$4.95 for 3 rolls…which is a STEAL). Anyway, The inks I used in the background were Early Espresso and Crumb Cake. 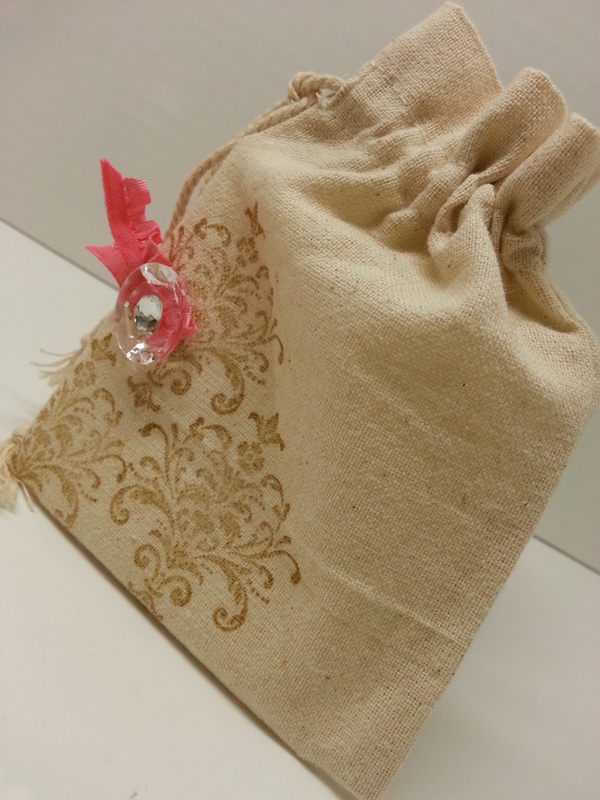 I wanted to keep it neutral and use the washi to add color. I love that it is a little see-through. 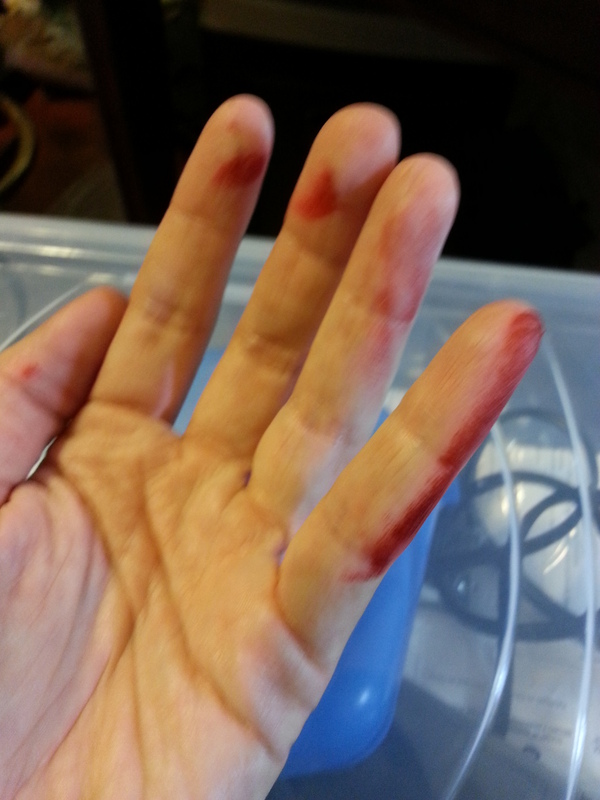 This makes it real fun to layer. For the card I used Crumb Cake and then layered with Early Espresso. I stamped on Very Vanilla. SO. Now. TAG. YOU’RE IT. It’s your turn to play with this wonderful stamp set, give to charity (when you order the set) and make some fantastic projects with it!! But, wait…. finish the blog tour of course! !